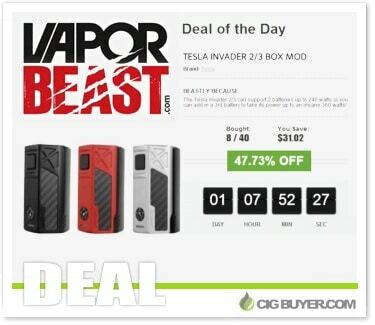 Tesla Invader 2/3 Box Mod “Deal Of Day” – ONLY $21.57! We shared this deal about a month ago, but Vapor Beast dropped the price by another $10! While supplies last, get the Tesla Invader 2/3 Box Mod for only $21.57! If you’re a fan of potentiometer dials, the Tesla Invader 2/3 is a unique setup that will allow you to run either dual or triple 18650 batteries. With enormous power (or battery life), it provides up to 360W of output with a variety of built-in safety protections. It has a sleek zinc alloy body with carbon fiber accents, LED indicator and oversized firing button.